Patients with minor areas of tooth decay or damage may put off treatment or think that repairing their damaged smile is unnecessary. However, using composite resin, tooth-colored fillings, smile repair is fast and seamless. If you’re a patient of Dr. Jamie Guthrie, don’t put off repairing a damaged tooth. We offer tooth colored fillings, dental crowns, and other restorative dentistry services that leave patients with flawless smiles. Call our caring dentist and skilled dentistry team to schedule your dental restoration appointment. The sooner we begin repair, the more likely we are to fully renew your smile using the most conservative treatment options. Left untreated, a tooth with just a small amount of decay or tiny crack can become much more severely damaged. Overtime, the cavity can spread out destroying more of the tooth or adversely impacting the health of surrounding teeth. As the strong, healthy tooth structure is damaged, teeth along the bite receive uneven amounts of pressure, which leaves them vulnerable to cracks, chips, and fractures. Repairing even one damaged tooth is essential to ensuring the health of your entire smile. Tooth colored fillings are quickly and comfortably placed in just one dental appointment. Using a putty-like composite resin material that is shaded to flawlessly match the smile, we can easily repair minor decay or damage. The area around the damaged tooth is numbed using local anesthesia. Then, we smooth the decayed tooth and apply the putty-like composite resin directly to the surfaces of teeth. 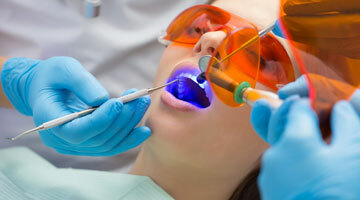 We shape the tooth colored filling material into place, mold it to restore the lost tooth structure, and use a curing light to harden the material into position. Finally, the tooth is smoothed and polished, leaving the patient with a flawless, natural looking smile. While tooth colored fillings are an excellent restorative option for patients with minor tooth decay or damage, they aren’t the ideal solution for ever situation. We offer a wide range of restorative dentistry options in our Ardmore dental practice. From the more advanced dental crown or root canal restorations to tooth replacement options like fixed bridges and dentures for teeth that cannot be repaired, our skilled dentist and team offer treatments to fully renew even the most damaged smiles.